"The beauty of yourself is Spiritualism and the beauty of Spiritualism is doing good to others." "When ten persons together recite OMSAKTHI!! the SOUL within each one of them attains PEACE." "It is not enough for a devotee clad in red to involve in spiritualism only. They should work together in unity and peace and forget about jealousy. The fate of the world can be completely changed for the better if one lives like this." Suyambu Arulmigu Adhiparasakthi temple is situated about 92 Kilo meters from Madras on the Madras - Trichy National Highway[NH.45] in a place called MelMaruvathur in Tamil Nadu, India. His Holiness Sri Bangaru Adigalar was born on March 3rd 1941, is a Golden day in the history of the world. 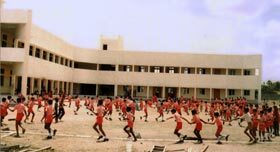 Adhiparasakthi Charitable,Educational, medical and Cultural trust was founded at Siddhar peetam in 1978, as ordained by "AMMA". His Holiness Adigalar is the founder president of the trust. The activities of the trust are guided and directed through the oracles of AMMA.The trust is undertaking educational, medical, cultural and social services with the guidance and directions of AMMA for the welfare of the society. In Melmaruvathur Adhiparasakthi Siddhar Peetam all the festivals are celebrated in accordance with the orders of AMMA's Oracle and not based on traditional methods. With the blessings of Annai Adhi Parasakthi and Arul Thiru. 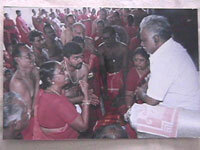 ADIGALAR we would like to inform you that during Adigalar's Holy trip to Dharmapuri district on 31st March, 2001, AMMA ordered the devotees to start the Sakthi Peedam temple construction at Valluvar Nagar, Dharmapuri. 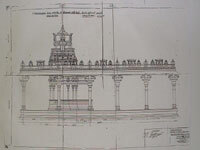 At Dharmapuri, the Adhi Parasakthi weekly worship center was started in the year 1981. With AMMA'S blessings the weekly worship center is now getting a new shape as a Sakthi Peedam temple, so we need your generous support to the on going work.